The Spring has finally come with great force. Fields are greening up and the trees are booming. Many spring flowers have blossomed. Everything is about life. Everything talks about life. Everything shows us that Jesus’ teachings must be present in all of us if we are to live in God’s Kingdom. If we live without this hope of following His teachings, it is not worth getting up and doing things. According to Augusta Belmont Bar, “Man is getting older if he wakes up without purpose and lies down without hope”. We have set our goal to serve the presence of Jesus’ love in the world. This gives us hope that whatever happens in life, God is always with us to help to make us a stronger being. We believe that we are stronger because of His presence, and we are not aging. Life is always changing and we must remember to lead our lives using the example of the love of Jesus. We must always strive with purpose and hope to be citizens of God’s Kingdom, where there is love and peace. Let the message of Easter awaken this hope in every man. Let it be a way to connect our souls and live together at the moment of celebration, through common goals and faith. You are always in our thoughts and may your Easter be joyous. Warm greetings to you Szabolcs, and all the congregation, from myself and the people of First Unitarian. As we treasure the small signs of Spring and new life that are beginning to appear, we look forward also to the fuller flowering of warmth in our world and our own lives, the gentler seasons that help us deal with the challenges of life that we all face. The hope and care that Jesus modeled in all his living and ministry are so important always, but especially now, in these days, when people are so often harsh and cruel with each other, and it is all the more important to live into kindness and generosity of spirit which are the essence of the hope that Easter offers. Especially this season, our team that is coming to visit with you all is ever-more anticipatory as the time for our trip draws nearer. It will be so good for those of us coming for the first time to get to know you all, and for those of us returning to spend time again with friends who have become very dear. This connection between our churches that spans time and space is a special and dear part of our experience of faith and we look forward to sharing our love of this faith with you all in just a few months from now. Warm Easter greetings and wishes for blessings and good fortune to all of you there in Szentegyhaza. We are so glad that soon we will be together. 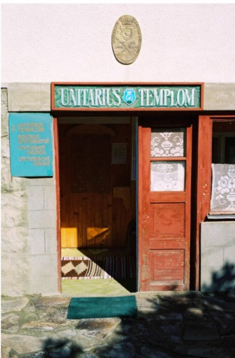 In 2008, our congregation voted to establish a partnership with a Unitarian Church in Szentegyhaza, Romania. The church is in a small town nestled near the Carpathian Mountains in an area called Transylvania, once a part of Hungary. Members of our congregation have visited our sister church three times. We have crisscrossed Transylvania, learning about its history and the founding of the Unitarian Church there in 1568. Members of the Szentegyhaza church have hosted us in their homes and treated us with warm hospitality. We have participated in their worship services and heard their bells ring from the bell tower we helped to build. You can see gifts they have given us used in our services and on display in our memorial garden. This ongoing relationship has created a special feeling towards our sister congregation and a deep appreciation of our shared religious heritage. For more information about this our partnership, click here: Why We Have a Partner Church in Transylvania. 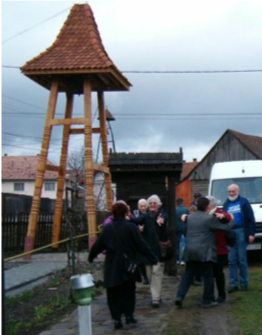 1930 First Congregational, now First Unitarian starts a partnership with a village in Transylvania. 1945 WWII causes contact to cease. The fall of Romania to Communism further suspends the relationship. 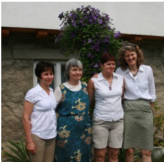 2004 First U meets with Unitarian Universalist Partner Church Council to discuss reestablishing a partnership in Transylvania. 2006 First Visit – First U members travel to Transylvania to explore possibilities of a partnership. 2008 Rev Kellerman and President Sandor Racz visit Providence, RI. First U congregation votes to establish a partnership with the Unitarian Church in Szentegyhaza. 2009 Second Visit to the Village. 2015 Third Visit to the Village. One of the keys to maintaining a strong relationship with our Partner Church is our visits with them. Everyone who travels to our sister church experiences a powerful friendship that seems to binds us together. The Szentegyhaza congregation always greets us with open hearted hospitality. Their desire to show us their traditions, and their willingness to learn who we are and teach us who they are, is the hallmark of an open and enduring friendship. This partnership is not about money or who can do what for whom. It is about much more; once you are in it and experiencing the friendship, it becomes very personal. It is like swimming in a river. You are immersed in it and must follow the current where it takes you. 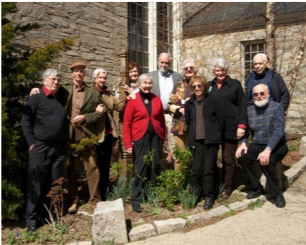 The partner church relationship gives us the opportunity to experience spirituality in the connections we make and the relationships we form with our Transylvanian Unitarian brothers and sisters. Click on the 2006 Visit, 2012 Visit and 2015 Visit to find out more information on these interesting trips. Various members of our congregation have visited our partners in Szentegyhaza. We usually plan our trips 6-12 months in advance. The trip usually starts in Kolozsvár, the city where the Unitarian Church headquarters resides. Each trip itinerary is different in some way. 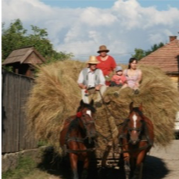 There is a lot of Unitarian history in Transylvania and each trip has explored a different part of the country. There are many UNESCO World Heritage Sites in Transylvania, many with Unitarian connections, and our trips include visits to some of these sites. 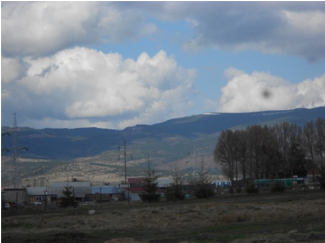 The trip usually last 10 days; the first 5 days consists of a tour through the countryside. Then we spend Thursday afternoon through Monday morning at our partner church. 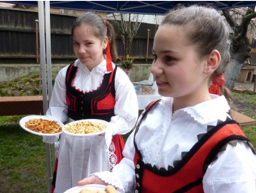 Each traveler experiences the hospitality of a member of the congregation in Szentegyhaza. This is the best part of the trip, a time where we get to know a family from the congregation. We sleep at their home or apartment, eat meals with them, and usually make a bond for life. The partner church hosts a number of events that showcase the area around Szentegyhaza. Come Sunday, We attend service and then eat a communal meal prepared in kettles over a wood fire in the church yard. The last days of the trip return us to Kolozsvár, where we catch a plane home, returning to America with wonderful memories and a new understanding of our faith. Szentegyhaza is located in Hargita County, Romania, an area that is predominately Hungarian speaking. It is the located near the Carpathian Mountains, at an elevation 2,800 feet. There are a number of churches in the area, but this is the only Unitarian Church. The church has about 300 members. The Szentegyhaza congregation is a triple minority in Romania. First, they are Unitarians in a country that is predominantly Romanian Orthodox. Second, they are Hungarian speakers where the majority of the country speaks Romanian. And third, they identify themselves as Szeklers, a minority subset of Hungarians living in Romania. The town is rural and does not have a lot of large businesses although it was home to a large steel factory, abandoned in the fall of communism. A number of the people in town farm for a living. Some herd their cows and are moved along village streets to nearby pastures in the morning and are brought back in the evening. A number of people in the congregation are migrant workers, and spend long periods of time far from home. Consequently, the full congregation does not usually attend services on Sunday. However, church attendance is especially high during major holidays when the church is too small to accommodate everyone. 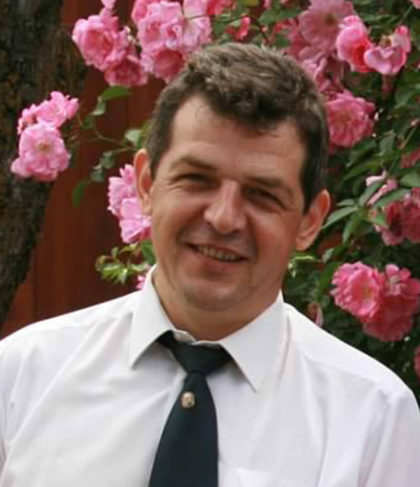 The congregation has been in existence for 25 years and was formed a few years after the Romanian Revolution of 1989 that toppled the Communist regime. Click on The People of Szentegyhaza to learn more about the friends we have made over the last ten years. 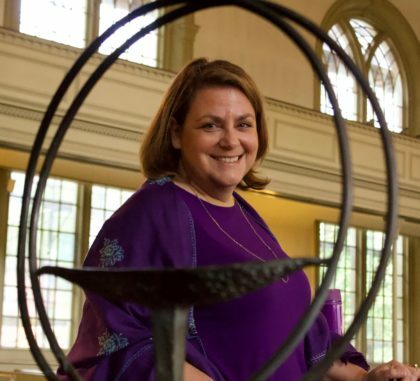 The Unitarian Universalist Association developed a support system for congregations that are interested in developing Partner Church relationships. Since 1993, the Unitarian Universalist Partner Church Council (UUPCC) has been developing these relationships. The UUPCC assists congregations in selecting partner churches around the world and has a travel office that helps congregations organize travels to their partner churches. Click on UUPCC for more information on this topic. The UUPCC is not just involved with partnerships in Transylvania but has supported relationships elsewhere. For more information on partnerships throughout the world, click on newsletters . Our congregation is considering a trip to our Partner Church in the early summer of 2019. The itinerary of the trip will be fine-tuned this winter, but it will begin in the “Unitarian Headquarters” of Transylvania, Kolozsvár. We generally tour Transylvania for about 5-7 days. The trip is always includes a Thursday –to-Monday visit in Szentegyhaza where we are all spend time in home visits with our host families. We are also making arrangements for the minister and his wife, Szabolcs and Eniko Kelemen, and their President, Zoltan Laszlo to come to our congregation in 2020 to help us celebrate our 300th Anniversary. The Transylvania delegation is now in the process of getting their passports for this trip. If you have any questions about the Partner Church please contact Tom Getz or Janet Downing Taylor. They will be glad to talk with you to discuss any questions you may have.